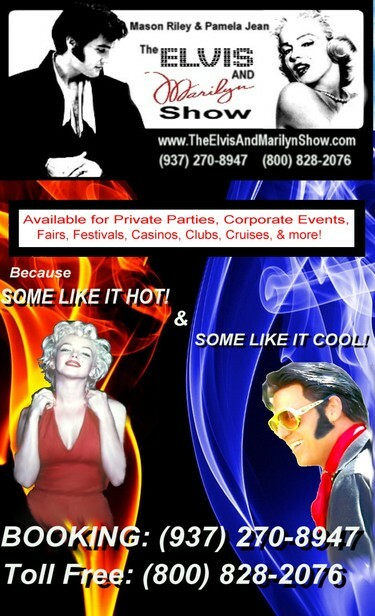 Celebration Of Stars: The Elvis And Marilyn Show! Celebrations Entertainment Services, inc. & Celebration of Stars Tribute Shows; News, Events, Special announcements, Casting Calls, behind-the-scene details from our entertainers and bands, and more. The Elvis And Marilyn Show! TWO SUPERSTARS! ONE STAGE!...AN EVENT TO REMEMBER! Since 1998, Celebrations Entertainment Services Inc. have provided clients award-winning entertainment throughout South-western Ohio, and touring acts throughout the U.S.. We are entertainers working with other local entertainers, bands, and performers to offer a full range of services for any Special Event. Check out our endless list of options for your entertainment needs: DJs, Bands, Tribute artists and Impersonators, Mimes, Clowns, Singing Telegrams, theme parties, entertainment for children, and Much More! visit us at: www.CelebrationOfStars.com and www.OhioSingingTelegrams.com for more about us, our friends and fellow performers, and everything we do. Bret Michaels impersonator, tribute Artist! Celebrations Entertainment Services/Celebration Of Stars,. Awesome Inc. theme. Powered by Blogger.